Quidsi.com today launched vine.com which is an exclusive store for Eco-friendly products. 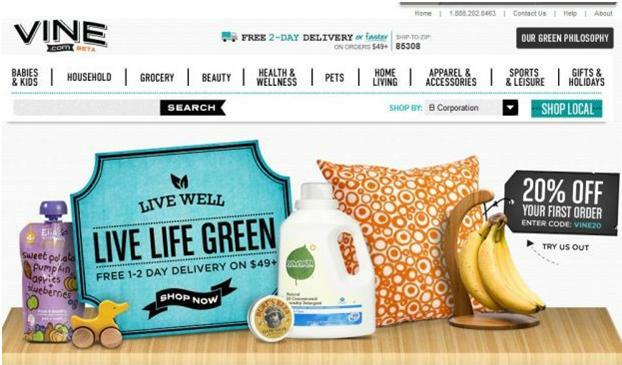 You can now shop from thousands of Eco-friendly brands across a wide range of categories in the comfort of your home. All items are backed by Vine.com’s 365-day return guarantee policy. All of their products are thoroughly reviewed to ensure that they are either from natural organic sources, or are non-polluting, or have been through an Eco-friendly manufacturing process. This ensures that you shop with a sense of pride for having contributed in safeguarding the environment. You can search products by name, brand, category, certifications and also by criteria such as organic, gluten-free, cruelty-free, fair trade or energy efficient. A dedicated team of phone and email customer support staff would be available 24/7 to help you with your issues. You can also check the exclusive “Vine Picks” which are individually certified by their team. You also have an option to search for local retailers within a geographic range. By this you can promote local businesses and also reduce the environmental impact that shipping would have. They have a huge selection of products which included apparel and accessories, sports and leisure goods and also gifting ranges. You can also shop for fair trade, made in USA and cruelty free listings. They also have an exclusive section for pets as well as for health and wellness. The site offers gift certificates from $25 to $1500 which can be redeemed on merchandize through vine.com and their family of sites . Your referrals would get a flat 15% discount on their first purchase. The site offers free shipping for orders above $49 or $39 for combined purchases from their other sites. Shipping is fast, and you would get the product within 2 business days.